Located in the heart of the Ice District in Edmonton, the MC Pop Up Salon was up and running for business last month! From February 23 to 27, MC College Hairstyling Students: Kelly Shirtliff (@kdshirtliff), Desire Poulin (@hairbydesirep), Nicolette Pirrott (@sharksloveteeth) and Taya Tkachuk (@taya.hair) worked as a squad to manage and operate their own salon, Shear Envy. “We got the opportunity to run our own salon. We built the prices and brought in our own clients. Just getting a feel of what a salon would be like was the best part!” says Desire. Check out their Instagram and @mccollegegroup for some of the lit hair transformations they did! Under the guidance of our Education Director, Anna Gemellaro, the students had over 36 customers and did 102 services – from candy colored hair to cuts and balayage. We even had return customers from our past Pop Up Salon! “They had great people skills and were independent yet willing to learn…They were never afraid to try a new technique…They kept me young at heart. BRAVO!” says Anna.
.@mccollegegroup so thrilled the pop up is back!! can’t wait for my appointment on Tuesday! Before beginning Shear Envy, the group presented a business plan and collaborated with MC College’s marketing department to create a logo and promotional materials. The students were provided with a POS, appointment booking system, and a full blown color and retail bar to enhance their experience as a salon owner. We asked them: what was your favorite part about the experience? Taya: “It was a great experience outside of school! It helped me understand what goes on behind the scenes of a salon”. Nicolette: “The infinite amounts of coffee and of course being able to make the rules! !…It’s all about your team and working as one”. A pop up store is a temporary shop that could be in business one week and then gone the next. 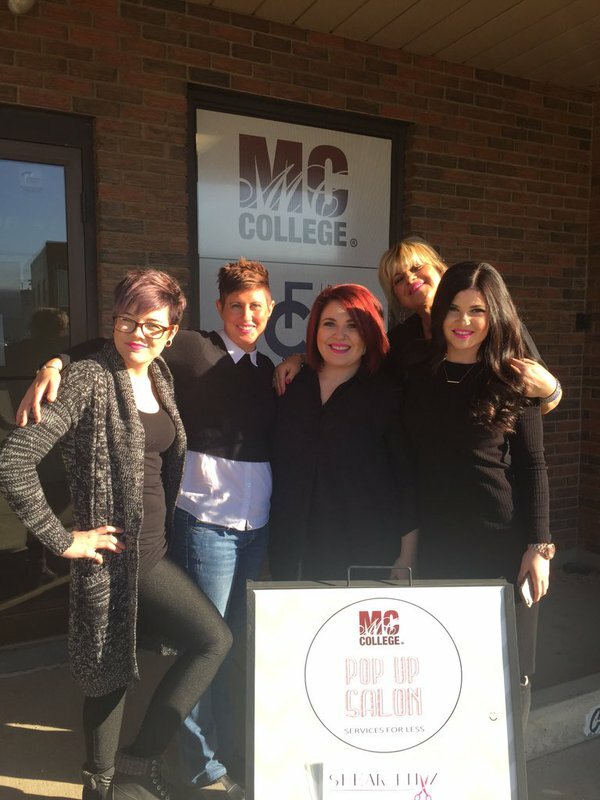 As part of the MC Pop Up Salon initiative, a team of students get the chance to own a salon for one week. They learn on-the-job skills in marketing, finance and operations, as well as develop their technical and communication skills. Follow us on social media to be the first to hear about the next Pop Up Salon!